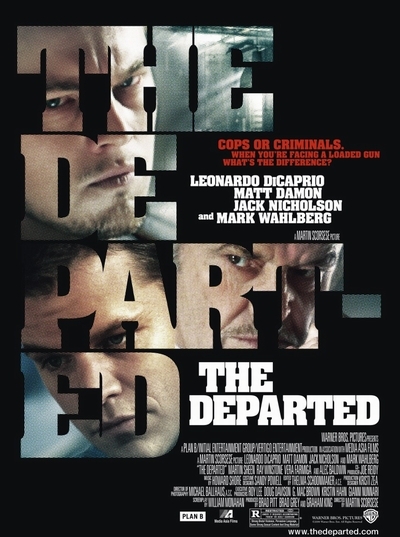 Story: "The Departed" is set in South Boston where the Massachusetts State Police Department is waging an all-out war to take down the city's top organized crime ring. The key is to end the reign of powerful mob boss Frank Costello (Jack Nicholson) from the inside. A young rookie, Billy Costigan (Leonardo DiCaprio), who grew up in South Boston, is assigned to infiltrate the mob run by Costello. While Billy is working to gain Costello's trust, another young cop who came up from the streets of "Southie," Colin Sullivan (Matt Damon), is quickly rising through the ranks of the state police. Earning a spot in the Special Investigations Unit, Colin is among a handful of elite officers whose mission is to bring Costello down. But what his superiors don't know is that Colin is working for Costello, keeping the crime boss one step ahead of the police. Each man becomes deeply consumed by his double life, gathering information about the plans and counter-plans of the operation he has penetrated. But when it becomes clear to both the gangsters and the police that they have a mole in their midst, Billy and Colin find themselves in constant danger of being caught and exposed to the enemy - and each must race to uncover the identity of the other man in time to save himself. The story of "The Departed" is based on the 2002 crime thriller out of Hong Kong called "Infernal Affairs," which achieved great success in Asia before coming west.